No matter how hard I try, I cannot escape politics. This summer I stepped right into it, unaware of just how delicate a situation I was entering. For the first time in decades, a new concessonaire contract was awarded at Glacier National Park. This contract includes the park’s historic fleet of red buses, which have been masterfully rebuilt from the frames of the original 1930s White Motor Company models. The red buses have come to represent Glacier, providing an iconic symbol associated with the park’s renowned Going-To-The-Sun Road. The buses were previously operated out of East Glacier, their hub being the Glacier Park Lodge, located on the Blackfeet Indian Reservation. That all changed last year when the National Park Service, much to the locals’ surprise, awarded Glacier’s concessionaire contract to Xanterra Parks & Resorts. Xanterra, in turn, pitched its tent on the west side of the park near the rapidly developing tourist towns of Whitefish and Kalispell. Losing the contract and its red buses has left East Glacier isolated and angry, its community suffering from a dramatic drop in revenue. There are hard feelings in the park. I experience them every day. I lost count of how many times locals, posing as tourists, came in to question me about Xanterra’s operations. I found the questions odd at first, but then began to notice a trend and with it an unpleasant demeanor. I was a target no doubt, the new guy with the 10 gallon hat, riding in to represent the big corporate outfit from Denver — unaware of just how many roots had been ripped out in this move. Early on, I tried to keep a positive attitude, but the constant attacks have worn me down. There are incredible logistical challenges here — it is a remote area drawing affluent visitors who expect every modern luxury while experiencing a true backwoods wilderness adventure. Delivering this total package is the challenge that gets me out of bed at 6 a.m. every morning. Through all the complaints, raised voices and temper tantrums, I have managed to keep my cool. I am determined to leave here with my dignity intact. Again, I think of my father often now and what it must have been like to go through those hurricanes back in Florida — as he did many times — and manage to keep emotions in checks while restoring power to the masses. Here in Glacier, appeasing tourists is just part of the equation. A big chunk of my time is devoted to our red bus drivers. Keeping them happy is as vital — if not more — than our guests. Affectionally known as “Jammers” for their gear shifting driving style, red bus drivers do require a certain skill set to succeed. The Going-To-The-Sun Road is no piece of cake with its twists and turns, falling water, ice and rock and God knows what else lurking in the other lane just behind the bend. Jammers provide commentary along the way, each with their own unique personality. Some have been doing this upwards of 40 years, others like me, thrown into the fire for the first time. 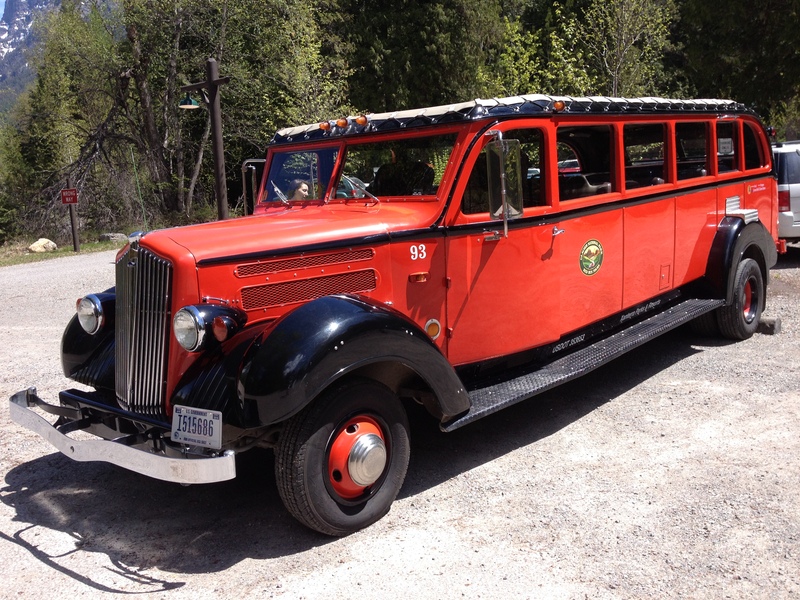 In the old days, it was college aged men driving the red buses across the Continental Divide. This year, in another first for the park, we have an equal number of women Jammers, including several college aged girls. Evelyn, one of our veteran Jammers, is quick to cite statistics showing women to be much safer drivers than men. I’m not sure where she gets her data, but Evelyn is not one to pick a fight with. She’s a motherly hen type, her beautiful white hair braided in a long ponytail and her knowledge of wildflowers is unmatched. Evelyn recognized early on that I was in for a rocky ride this summer. Hey John, thank God for those positive voices that appear just when we need them to keep our boat afloat. Great post from a great man! Disheartening to say the least – you are a brave soul, Mr. John! John – I knew that Xanterra would not meet up to the service previously provided by GPI. Hopefully it will smooth out in time. Too bad East Glacier is being affected poorly.